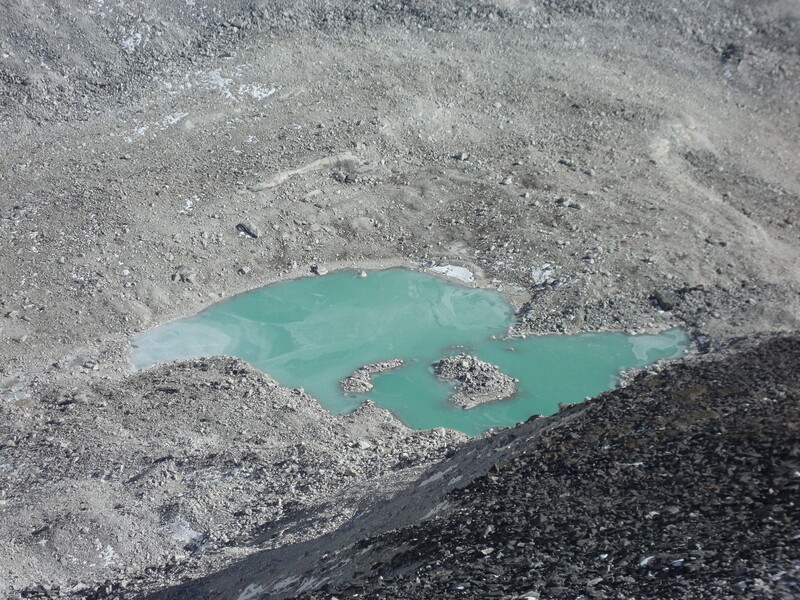 ‘Chop-chop,’ Dorje echoes, and we begin the traverse along rocky ridges towards Camp II and the dreaded Yellow Tower. Surprised, I find myself taking the greatest of pleasures in gliding over sun-lit precipices and among sharp rocks, their edges of ice glowing beautifully. The going seems easy and my guide and I laugh and joke. 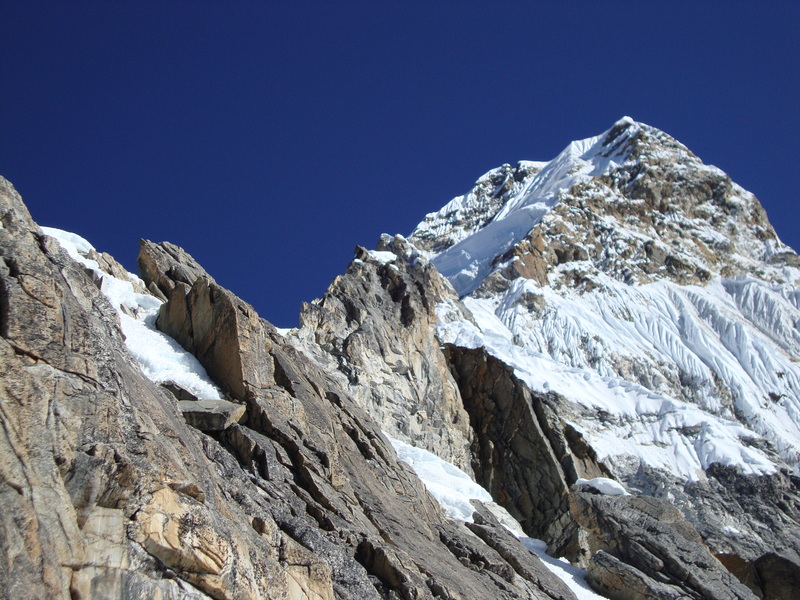 A thought creeps into my mind, carefully and shyly at first, that I might be able to pass the rock test of Ama Dablam after all. In a few minutes Dorje points up and my heart falls all the way back down to base camp. I have climbed rock like that – and steeper – before but without a heavy pack and certainly not wearing clumsy old trekking boots. The other Sherpa and his two clients, the alpine guides, catch up with us while, doubtful, I stand at the foot of the Tower. They climb up with ease and throw me a rope to tie myself to for extra safety. 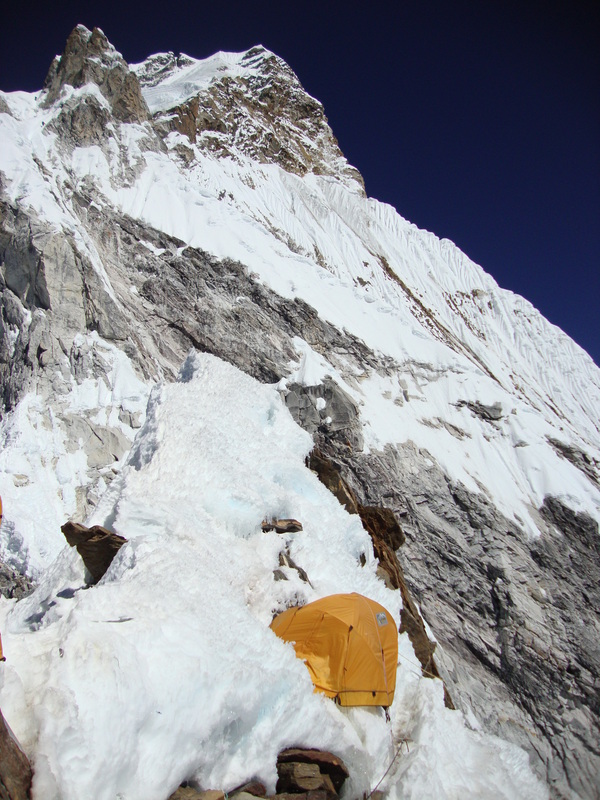 Then, I clip my jumar into the fixed rope and step onto the smooth vertical face of the Yellow Tower. ‘Ok, I’m coming,’ I say. Except, I am not really able to move. I look around me for something to hold onto or a place where to put my slipping feet but can’t see anything fitting; I reach left and right – nothing. I am breathing heavily, trying to pull myself up the fixed rope but my arms, numb with effort, can’t hold my weight and I slip, swinging all the way to the left of the rock face. As quickly as I can I glue myself to the wall, finding holds for both my hands, and gather myself. Embarrassed, I look up and see a large group waiting for me to get off the fixed line; one female climber looks particularly annoyed with my ‘monkey-ing’. ‘Sorry!’ I call out. She says nothing and turns away. Busy and tired as I am, I can’t help giggling at the solemnity of the lady’s expression. ‘Half an hour,’ he says. ‘Go on; Camp 2 is not far away.’ 20 metres, 30 minutes – I did horribly bad! I thank him wholeheartedly and stumble away, like a defeated boxer off the ring, following the fixed ropes. 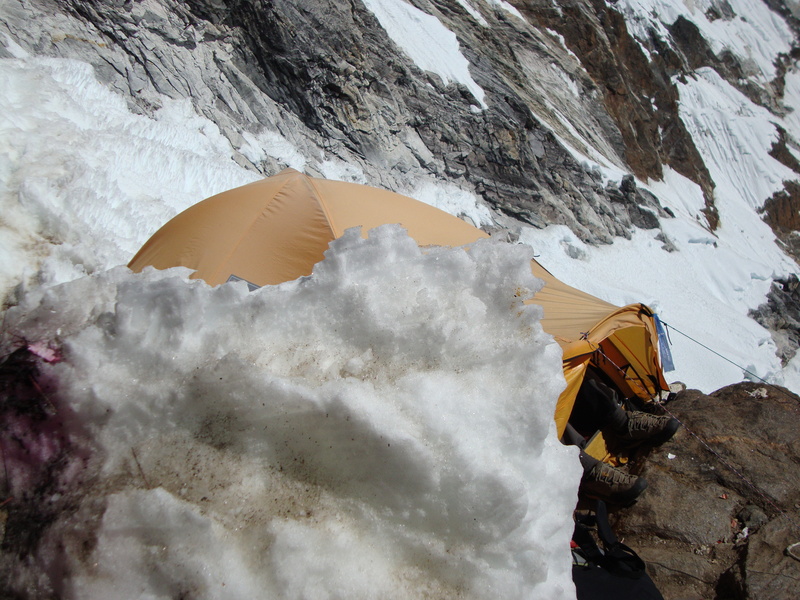 A couple other tricky sections delay my progress momentarily but sooner rather than later I see Camp 2 with about five tents placed at reason-defying angles on the tiny rock plateau. When my guide arrives, he immediately trots off to get some ice for our ‘cooking’, while I crawl into another little yellow home for another cold night. In the dark the tired Christophe arrives and I try to revive him with a can of Red Bull: my guide is carrying plenty of it for me as it is my main source of energy on the mountain; it is also a source of endless jokes among my peers and the Sherpas who are quite certain I couldn’t make a step without my ‘magic potion’. Christophe, the guides and I discuss the upcoming summit day. He and I are slower than the long-legged Austrian duo and, therefore, we choose to leave Camp 2 several hours ahead of them, at 3 am. None of us will stop to spend the night at Camp 3, which will make the summit day a long and truly exhausting one: 3-4 hours of technical mixed climbing in the dark to Camp 3 (the famed Grey Tower and the Mushroom Ridge are both there), another 5-6 hours of slightly easier climbing to the summit and at least another 3-4 hours to get back down to Camp 2. ‘No,’ I reply decisively, ‘we’re going to climb light to save time and energy. I don’t want to stop at Camp 3.’ As I say this, I already know I am making a mistake but I feel like I want to make it – need to make it for some strange reason. Before going to sleep, we set the alarm for 2 am, pack and try to eat but the sole thought of it makes me nauseous: more instant soup and tea, then. Any gold in them thar hills? There’s really nothing up there – and that, to me, is the most beautiful thing about the mountains.